The Society for Calligraphy & Handwriting’s (SCH) next meeting is Thursday, January 18th, starting at our new time, 6:30 pm, at Jubilee REACH,14200 SE 13th Place, Bellevue, WA 98007, in Room 203. Please view our meetings page for a map and directions. 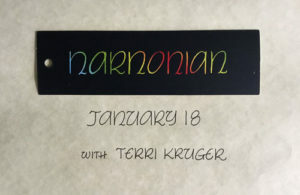 Terri Kruger will be teaching Narnonian Hand, a fun and versatile variation of Pointed Uncial, great for beginning and intermediate calligraphers. 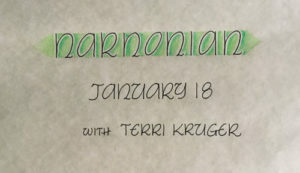 We will cover basic letterforms, border, color and shading techniques and learn how to write on a variety of surfaces, such as glass, fabric and leather. Please bring fun pens, such as metallic, gel and glitter (fine to medium point), pencil, a Pigma Micron pen, masking tape, 6 or 7 colored pencils, ruler, pencil, and lined notebook (such as college-ruled spiral pad). All other papers and supplies will be provided. There is a $5 supply fee.